Much of it is due to government blundering. But opposition protests, often violent, and destabilization from Washington have wreaked havoc as well. As I reported for The Nation in late June, while Venezuela is not “in a state of total collapse,” as per The New York Times and other mainstream media sources, the country is in the midst of a very severe crisis, which is getting worse. Venezuelans are not dying, or starving, or looting en masse. But many, far too many, are suffering. Why? And what could be done to ease this suffering and help Venezuela get back on its feet? These are difficult questions to answer. This is not merely because Venezuela’s crisis has multiple causes, short-, medium-, and long-term. Nor is it because some of the causes, and potential solutions, to the crisis are quite technical. The difficulty lies, rather, in the challenge, and perhaps impossibility, of disentangling the “internal” and “external” aspects of the crisis. To an agonizingly large degree, Venezuela’s crisis is of the government’s own making. Instead of easing or ending it, the government’s actions—and inactions—over the last several years have made it far worse. Yet, the government has not acted in a vacuum, but in a hostile domestic and international environment. The opposition has openly and repeatedly pushed for regime change by any means necessary. In addition to fostering a politically toxic climate, the opposition’s actions over the past three years—its refusal to recognize President Nicolás Maduro’s April 2013 victory, despite absolutely no evidence of electoral fraud; ensuing violence that targeted state-run health clinics and left at least seven civilians dead; another wave of violence beginning in February 2014 that left 43 dead, approximately half of them due to opposition actions; and recent and repeated calls for military and foreign intervention—have also had a very damaging economic effect. An honest account of the crisis must include both of these aspects: the government’s costly errors, and the destabilizing actions of the opposition and US government. To ignore one or the other is to misrepresent reality and perpetuate false all-or-nothing narratives that blame the crisis, in its entirety, on either “socialism” or the “Empire.” Such narratives may comfort those seeking affirmation for preconceived notions, but they will not aid those seeking to know why Venezuela is in crisis and how it might get out of it. The main features are the following: runaway but not (yet) hyper-inflation, which government sources unofficially put at 370 percent for the past 12 months, and which the IMF estimates will top 700 percent for 2016; multiple years of low and negative economic growth (1.3 percent in 2013, -3.9 percent in 2014, -5.7 percent in 2015, and an estimated -10.1 percent in 2016, according to the IMF, with the Economic Commission on Latin America and the Caribbean forecasting -8.0 percent growth in 2016); a 40 percent drop in imports this year, and a 60 percent drop since 2012; chronic scarcities of food, basic goods, and medicines, with an estimated 80 percent scarcity index; a 40 percent drop in oil-export income in 2015, exacerbating an already acute shortage of dollars; high levels of corruption in the public and private sectors, leading to a massive leakage of public revenue, purportedly reaching hundreds of billions of US dollars; growing anxieties among the population about whether and how they will meet daily survival needs as well as about the future of the country; and a mounting political crisis, marked by widespread rejection of the government, but no significant increase in support for the opposition, with over 50 percent of the population identifying with neither the government nor the opposition. In mainstreams accounts, the cause of Venezuela’s crisis is clear: an excess of “socialism.” This mythological entity is regularly trotted out and used to signify a plethora of ills allegedly afflicting the country, including dictatorial rule, unremitting hostility toward the private sector, and suffocating state control of the economy, society, and all aspects of life. Unfortunately for its proponents, the “socialism killed Venezuela” thesis ignores three important facts. First, Venezuela is not a dictatorship. The ruling United Socialist Party of Venezuela (PSUV), formerly the Fifth Republic Movement (MVR), has been repeatedly affirmed at the polls, winning twelve of fifteen major elections between 1998 and 2015. The government has won these elections cleanly, and has immediately conceded on the rare occasions when it has suffered defeat, including last December’s parliamentary elections. The government’s actions have not always been beyond reproach. Criticisms that Chávez and Maduro have interfered with judicial independence, for example, appear to have some merit. Nor is the National Electoral Council (CNE) completely above reproach: The CNE recently excluded 600,000 signatures (out of nearly 2 million submitted) from a petition seeking a recall referendum against Maduro, on grounds that seem dubious in at least some cases. Yet, despite hiccups, delays, and fiery rhetoric from government officials, the recall process has been allowed to proceed (see below). There is no case for arguing—as there is with Honduras, Paraguay, and Brazil—that Venezuela has suffered an “unconstitutional alteration of the constitutional regime that seriously impairs [its] democratic order,” Thus the decision a few months ago by Luis Almagro, head of the Organization of American States, to invoke the Inter-American Democratic Charter against Venezuela on these grounds appears hypocritical and unwarranted. Second, while Venezuela has moved away from free-market capitalism, its economy is hardly socialist. The private sector, not the state (and still less the social economy), controls the overwhelming majority of economic activity. Between 1999 and 2011, the private sector’s share of economic activity increased, from 65 percent to 71 percent. Chávez did commit major errors, among them failure to tackle corruption and dismantle currency controls. Third, the government’s significant economic mismanagement in recent years should not be misconstrued as evidence that the government mismanaged the economy throughout its seventeen and a half years in office. During Hugo Chávez’s fourteen years as president, Venezuela experienced respectable economic growth, averaging 3.2 percent a year. Growth averaged 4.1 percent a year from 2004 on, after Chávez took control of Venezuela’s state oil company, PDVSA, in the wake of an opposition-led oil lockout that severely damaged the economy. To be sure, this growth was made possible by the 2003-2008 oil boom. Yet, the non-oil sector grew faster than the oil sector during this period, and government reserves increased. And inflation and unemployment were both considerably lower during Chávez’s years as president, compared to the years before he took office (with unemployment declining significantly from 2003 on). Even so, it cannot be denied that Chávez committed several major errors that have come back to haunt Venezuela today. In particular, he failed to effectively tackle corruption, dismantle currency controls after they had served their purpose, and wean Venezuela from its extreme dependence on oil. The government has taken a series of actions that could be characterized as “socialistic,” although many of these measures are more accurately described as social democratic. Under Chávez the government significantly increased spending on healthcare, education, and social services. Access to food, housing, and basic utilities was partially decommodified through state subsidies and price controls. This led to dramatic reductions in poverty, inequality, and child malnutrition, major increases in school and university enrollments, and a quadrupling of the number of pensioners. The government has also engaged in extensive organization and mobilization of the popular sectors in an effort to construct “participatory and protagonistic democracy.” This led to the creation of tens of thousands of grassroots organizations throughout the country. Critics charge these organizations with being exclusionary and subordinate to the state and ruling party. My own and others’ research shows that the reality is far more complex, with popular movements pushing back against government control and fostering an impressive, if fragile, degree of popular power. Finally, the government implemented land reform and has nationalized over 1,200 firms, with a number turned over to worker control. Have these socialist/social democratic measures brought on the current crisis, as critics claim? If so, does this demonstrate the impossibility not only of socialism, but of any and all alternatives to free-market capitalism? Three arguments are commonly made. The first is that social policies favoring the popular sectors were unsustainable since they were made possible by record-high oil revenues. Once these revenues dried up, as they currently have, state spending on social services, and just about everything, would have to decline. The second argument is that state social spending was excessive and directly contributed to the current crisis by diverting PDVSA’s profits away from necessary reinvestment in oil production. (In 2011 $49 billion and in 2014 $57 billion in oil revenue went to social spending.) The third argument is that price controls and the threat of expropriation have stifled private production and, in fact, made it impossible for private producers to operate, since prices for many products were lower than production costs. These arguments cannot be entirely dismissed, but they need to be significantly qualified. The government’s current fiscal woes—international reserves are below $12 billion, the lowest level in over a decade, with reserves falling by half in the past 18 months, and by nearly two-thirds since 2010—underscore the carelessness with which Venezuela managed its oil bonanza. The drop in oil production over the past three years suggests there is something to the argument that the government should have reinvested more oil revenue in PDVSA and spent less elsewhere. Bloomberg reports that according to the International Energy Agency, the main factor behind the current drop in production is a failure to pay oil-services companies. It is also hard to argue that producers should be expected to continue making products that they must sell at a loss. 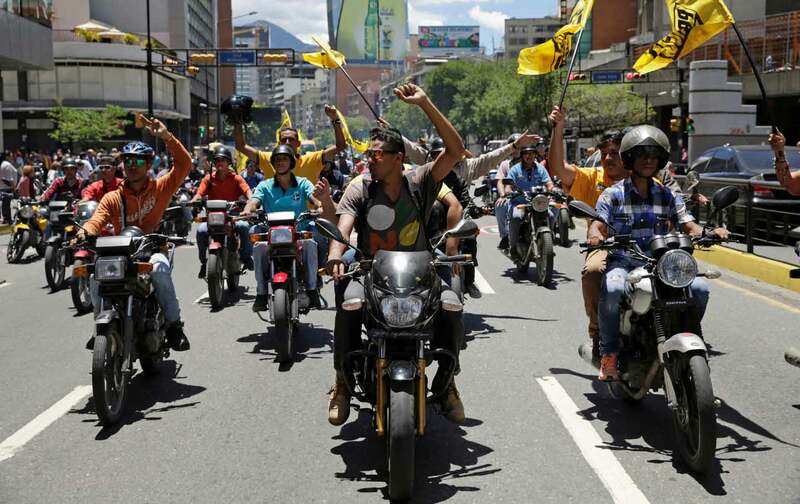 An argument can be made, however, that Venezuela’s current woes are due less to excessive social spending and stifling regulations than to the haphazard implementation of government policies in general, and the inflexible implementation of specific policies. If socialism is understood as a system in which workers and communities (rather than bureaucrats, politicians, and well-connected entrepreneurs) exercise effective democratic control over economic and political decision-making, it would appear that Venezuela is suffering not from too much socialism, but from too little. Who can deny that Venezuela would be much better off if the hundreds of billions of dollars reportedly diverted through corruption were instead in the hands of organized communities? Interviews with grassroots Venezuelan activists involved with communal food production and distribution suggest that popular control of economic activity generates far less corruption than state and private control. This is because organized communities exercise collective control, guaranteeing a much higher level of transparency and accountability. The different exchange rates have created immense incentives for corruption among businesses and state/military officials. To the argument that price controls and state regulation have wrecked Venezuela’s economy, a counterargument can be made: Rather than viewing price controls and state regulation of economic activity more generally as inherently irrational (and immoral), the specific context within which price controls and other regulations operate in Venezuela must be taken into account. To do this, we must begin by analyzing the macro and microeconomic distortions created by the currency crisis. While falling oil prices and corruption are key contributors, the single greatest cause of Venezuela’s crisis is the government’s mismanagement of its currency. The problem stems from the coexistence of three different exchange rates, and the yawning gulf between the lower of two official rates and the black market, or parallel, rate. The lower official rate is set at 10 bolivares/dollar, a jump from 6.3 Bs/dollar earlier this year. This rate, known as the DiPro, is used for “essential imports” such as food, medicine, and material inputs needed for domestic production of key goods, as well as a variety of other goods and services. Until recently the vast majority of legal foreign transactions took place using this lower rate. There is a second official rate (which came into being in March, superseding an earlier multi-rate system), known as the DiCom, which has risen in a “managed float” from a rate of 200 to 640 Bs/dollar since March. There were hopes that an increasing number of economic transactions would take place at the DiCom rate, although to date it appears that the lower DiPro rate is still much more utilized. Finally there is a fluctuating black-market rate, which has risen enormously over the past several years. This rate is currently over 1,000 Bs/dollar and reached a high of 1,211 Bs/dollar in March 2016. The huge difference between the lower official rate and the black-market rate has generated several major problems. First, it has created immense incentives for corruption among businesses and state/military officials who are provided dollars by the government at the lower official rate. These businesses and officials often trade these dollars on the black market in order to make obscene profits. Second, the diversion of dollars away from imports and into illegal black-market trading has contributed to severe scarcities as well as the marked drop in imports. Third, production by legitimate businesses (as opposed to ghost enterprises, so-called empresas de maletín) has declined because of their lack of access to dollars and needed inputs. Fourth, all of this contributes to the inflationary-devaluation spiral occurring in Venezuela, in which inflation goes up and up, even as the effective value of the bolivar plummets. Venezuela’s present currency system dates from 2003. It was established to prevent capital flight in the wake of the economically devastating 2002-2003 oil lockout, and amid intense political polarization. At the time, this was a sensible move. Most economists, however, including many sympathetic to the government, believe currency controls should have lasted only a few years. Once the threat of capital flight subsided, the currency should have been allowed to float against the dollar, as was the case before 2003, and as is the case in most countries. Mark Weisbrot of the Center for Economic and Policy Research has argued for years that the government should re-establish a free float of the currency as the best way to overcome the current crisis. Doing so would immediately end one of the major incentives for corruption, and should relatively quickly lead to an easing of scarcities, a rise in imports, and increased production. A key question is why the government has not abandoned controls. There are several factors that may explain this. The first is the government’s fear that devaluation would lead to even greater inflation. Many observers feel that this fear is overstated; their view is that Venezuela has already suffered from a de facto devaluation. Devaluation, in this view, should help settle the economy. A second explanation, which is difficult to substantiate but seems highly plausible, is that powerful interests inside and outside the state that are benefiting from the current system—particularly high-ranked military officials and import businesses—have blocked change. Maduro’s desire to keep the generals happy—to prevent them from heeding opposition calls for a coup—may help explain why the government has been maddeningly unwilling to devalue the currency. A third factor is that devaluation is a difficult undertaking that requires proper implementation to avert public anxieties. The fear and uncertainty found in Venezuela today, in large part due to the opposition and US governments’ destabilizing actions, is thus another obstacle that has likely factored into Maduro’s lack of action. One of Chávez’s biggest failures was not weaning Venezuela from its dependence on oil. What goes up must come down. As with gravity, this is true of the price of oil, of which Venezuela has the largest proven reserves in the world. After plummeting to historic lows in the late 1990s, the price began to climb from 2003 on. This was due to the global commodities boom (driven by Chinese and Indian growth), as well as Chávez’s success in reinvigorating OPEC. From 2005 to 2008 and from mid-2009 to 2014, the price of oil was particularly high, hovering in the $80-100/barrel range, and reaching a record high of $152/barrel in June 2008. During these years Venezuela accrued immense oil rent, which fueled (quite literally) the tremendous social gains achieved under Chávez. The high price masked the dangers of Venezuela’s extreme dependence on oil, which accounts for 96 percent of the country’s export earnings and approximately half the government’s revenue. Between June 2014 and January 2016, the price fell by more than two-thirds, from over $100/barrel to under $30/barrel. Since January, it has recovered a bit, rising to nearly $50/barrel in May, before dropping to just over $40/barrel in recent weeks. Plunging oil prices would have hurt Venezuela under any circumstances, but the effect of low prices has been particularly devastating because it coincides with the damage wrought by the currency crisis. Venezuela’s extreme dependence on oil is a longstanding problem. As such, it is unfair to lay all the blame for this situation at the feet of Chávez (or Maduro). Chávez does, however, undoubtedly bear significant responsibility. The percentage of Venezuela’s export earnings from oil increased from 68.7 percent to 96 percent between 1998, the year Chávez was elected, and the present. Chávez frequently talked of diversifying Venezuela’s economy, but in practice did little to achieve this goal. To avoid future crises it is imperative that Venezuela start moving in this direction in a serious manner. Otherwise, Pérez Alfonzo’s words of warning will ring true for many more decades to come. The government’s third major failure, in addition to the currency crisis and oil dependence, is its unwillingness and/or inability to effectively tackle corruption. In 2015 Transparency International listed Venezuela as the tenth most corrupt country in the world (out of 167 listed). Perhaps more important (given the problems with supposedly objective but inherently political country rankings), most Venezuelans appear to view corruption as a major problem. In a June 2015 interview, Roland Denis, a revolutionary activist who was Chávez’s vice minister of planning and development in 2002-2003, paints a devastating picture of pervasive corruption within the Venezuelan state. According to Denis, the number of officials involved in corruption is “not four or five, but…hundreds who in turn have created their own networks of collaborators and frontmen.” The list of state institutions involved in corruption named by Denis is extensive, and includes the following: Corpolec, the state electricity company; CANTV, the state telephone company; the housing mission; the food ministry; SENIAT, Venezuela’s tax agency; the Venezuelan Central Bank; CADIVI, an institution set up to manage currency controls; SIDOR, the state-owned steel manufacturer; and the state oil company, PDVSA. Denis also lists a number of private companies, domestic and foreign, that he suspects, but cannot prove, have been involved in significant corruption, including: General Motors; Polar, Venezuela’s leading food and beer manufacturer; Toyota; Colgate; pharmaceutical companies; tire companies; and others. Denis puts the amount of money lost due to manipulation of currency controls alone at $300 billion, suggesting that the total losses due to corruption may be much higher than this. It is ironic, and obviously disappointing to his followers, that corruption grew to new heights under Chávez. Chávez’s initial rise was fueled by Venezuelans’ disgust with growing corruption in the 1980s and ’90s. It is thus ironic, and obviously disappointing to his followers, that corruption grew to new heights under Chávez. A plausible explanation for his failure to effectively tackle it is the widespread belief that much of Venezuela’s corruption involves military personnel, particularly high-ranking generals. Many Venezuelans believe Chávez turned a blind eye to corruption among officers who were loyal to him during the 2002 coup and after. Maduro’s failure in this sphere likely stems from a different reason: his political and institutional weakness, and his need to keep the military on his side amid the daily convulsions shaking the country. Whatever the explanation, Chávez and Maduro’s collective failure to root out corruption has generated three negative consequences. The first, of course, is the immense loss of state resources. The second is the public’s loss of faith in public institutions. The third is the political opening that Chávez and Maduro have given to opposition politicians, who can correctly (if in many cases hypocritically, given their own likely past and/or present links to corruption) accuse the government of failing to protect the nation’s wealth and the integrity of public institutions. The Venezuelan government’s explanation for the country’s current woes is that private businesses and the US government are waging an “economic war” against the government, deliberately manufacturing scarcities and economic malaise to bring the government down. The opposition, Western mainstream media, and the US government dismiss this claim as pure propaganda. How should we make sense of these competing claims? The economic war against Venezuela, carried out by both the opposition and US government, has caused immense damage. The government’s claim that the economic war is the main, or only, cause of the current crisis is not accurate. Yet there is clear evidence that the economic war is real, and is one of the factors behind the current crisis. This suggests that, as pro-government sources have claimed, there are parallels between Venezuela’s current situation and the crisis that confronted Chile in the early 1970s due to Richard Nixon and Henry Kissinger’s efforts to “make the economy scream” to bring socialist president Salvador Allende down. There are three facets to the economic war. The first is hoarding of food and basic goods (e.g. toilet paper, toothpaste, flour, etc.) by private producers opposed to the government, to deliberately manufacture scarcities and generate popular opposition, particularly in the lead-up to elections. There is evidence this has occurred on multiple occasions, including the 2002-2003 oil strike and the run-up to the December 2007 constitutional referendum, which (perhaps not coincidentally) was Chávez’s first major electoral loss. Following the PSUV’s loss in the December 2015 parliamentary elections, there were reports on social media that products missing before the election had reappeared on grocery shelves. In June of this year, Myriam Gimenez, a Chavista activist from the city of Carora, told me, “We say that we lost the [December 2015] election because of black beans. In the weeks before the election you couldn’t get black beans anywhere.” After the election, Gimenez said, black beans reappeared. The second facet of the economic war is the damage to Venezuela’s economy wrought by US government actions. The most visible recent example (but by no means the only one) was President Obama’s March 9, 2015, executive order declaring that “the situation in Venezuela” poses an “unusual and extraordinary threat to the national security and foreign policy of the United States.” This order, which was renewed this past March, placed sanctions on seven high-ranking Venezuelan government officials accused of human rights abuses and corruption. It is worth pointing out that when this occurred, Venezuela’s anti-government opposition rejected the “extraordinary threat” language and declared, “Venezuela is not a threat to any nation.” There is, of course, a direct economic effect of US sanctions against a country, or officials within a country. More important are the indirect effects, which, as Mark Weisbrot has pointed out, send a message to would-be foreign investors that the country being targeted may not be a safe place to invest in. Weisbrot notes that foreign “financial institutions that wanted to arrange a swap for Venezuela’s gold…a couple years ago, they couldn’t do it.” According to Alex Main, a senior associate for international policy at the Center for Economic and Policy Research, “Contacts in the financial sector have noted that the U.S. Treasury Department has strongly urged investors and bankers to avoid making loans to the Maduro government. Recent U.S. sanctions targeting Venezuelan officials also serve to discourage U.S. and European banks from doing business with Venezuela.” Recent US actions have had a considerable and highly detrimental impact at a time when Venezuela is in desperate need of dollars but is prevented from gaining access to them by Washington, which has made little secret of its support for Venezuela’s anti-government opposition. The third facet of the economic war is the economic and psychological cost of the opposition’s often violent push for regime change. It is difficult to measure the precise extent to which violent protests, such as occurred from February-April 2014, have damaged the economy. In March 2014 the government claimed that opposition blockades “reduced the supply of basic goods by 60 percent.” And in an April 2014 New York Times editorial, President Maduro wrote, “These violent actions have caused many millions of dollars’ worth of damage.” I have not been able to find a reliable independent estimate of economic damage due to the February-April protests. Venezuelan government estimates do not, however, seem implausible. In addition to the direct material costs of violent protests, which have targeted state-run health clinics and other public institutions and undoubtedly led to extensive property damage, there are significant but harder-to-calculate psychological costs borne by the public. The climate of fear and uncertainty prevalent today is in no small part due to the opposition’s actions. This has almost surely contributed to the government’s unwillingness to pursue necessary but new, and thus uncertain, policy measures such as floating the currency, which can only succeed if the government can generate trust among the population. While it pains me to write these lines, I see little reason to be optimistic regarding Venezuela’s prospects in the near future. The main reason is that the government continues to show a lack of will in addressing the currency crisis. Hopes that the government would implement a free float of the bolivar were dashed the first week of August when Maduro replaced Minister of Industry and Commerce Miguel Perez Abad. Since his appointment in February of this year, Perez Abad had consistently pushed for a free float, and just before he was replaced he stated that it would happen within 60 days. His replacement suggests that this is highly unlikely. In addition to replacing Perez Abad, Maduro appointed Gen. Nestor Reverol as his new interior and justice minister. This occurred just after Reverol was indicted by the United States for drug trafficking. Maduro rejected these charges, which he sees as politically motivated. Maduro’s embrace of Reverol is intended as a demonstration of his nationalist anti-imperialism. Unfortunately, it can also be interpreted as evidence of Maduro’s continued unwillingness to confront corruption in the military. If this is the case, it is another ominous sign for the future. The government has shown some initiative in diversifying the economy. However, the steps it has taken are highly controversial. Last week the Maduro administration announced a $4.5 billion agreement with eight national and transnational companies to allow open-pit gold mining in the state of Bolivar. This initiative has been fiercely criticized by Venezuelan social movements, environmental activists, and indigenous communities due to its ecological and social impacts. The New York Times just published an article documenting how the surge in illegal mining has contributed to an alarming rise in malaria. The government’s initiative does have its supporters, including notable critics of Maduro such as Roland Denis. In a recent piece published by aporrea.org (a critical-left Venezuelan website), Denis argues that despite its major and undeniable shortcomings, this deal should be supported because it is preferable to the status quo of illegal mining, with its negative consequences including no benefits to the government. The new deal would allow the government to capture some additional, and desperately needed, income. Notably, Maduro has promised to direct 60 percent of state revenue from the deal toward social spending. These arguments do not mollify critics, who say the deal does not address the pressing need to develop non-extractive sources of development. Efforts to recall Maduro continue to move forward, albeit at a slower pace than the opposition, and a number of foreign governments, including the United States, would like to see. On August 1 the National Electoral Council (CNE) announced that the opposition had succeeded in collecting and validating the 1 percent of registered-voter signatures needed to trigger the next step in the recall process: collecting signatures from 20 percent of the electorate, which would trigger a referendum. Last week the CNE announced that the earliest date it could take place would be late February 2017. Since this date comes after the official midway point of Maduro’s presidential term, his defeat, which seems likely, would result in his replacement by Venezuela’s vice president, Aristóbulo Isturíz, rather than a new election. Officially, the opposition is adamantly opposed to delaying the referendum beyond January 10. There is speculation, however, that many opposition leaders actually prefer this scenario because the next several years are likely to be exceedingly difficult no matter who is in office. If the Maduro government stays in power it will pay the price. The opposition would thus be well positioned to win the 2019 presidential election. It is worth pointing out that, while the opposition will (publicly) castigate the government if a recall referendum does not take place this year, opposition leaders delayed initiation of the recall campaign by several months. The opposition thus shares at least some responsibility for the delay. Would an opposition government, now or in 2019, help resolve Venezuela’s crisis? It is of course difficult to predict what will happen in the coming months, let alone the coming years. Yet there is little evidence that an opposition government would prove more capable than Maduro’s. Since winning the December 2015 parliamentary elections, opposition leaders have said next to nothing about their plans for addressing the crisis. In June I asked a top official in the administration of Carlos Ocariz, the mayor of Sucre municipality and a top figure within Primero Justicia (a leading opposition party), about opposition plans. He responded with a common line: “There can be no economic change without political change.” Chavistas believe the opposition is reluctant to reveal its true plans because they would be so unpopular; they’re rumored to include full-scale privatization of the economy and a painful agreement with the IMF. It is far from clear that such actions are what Venezuela needs to get back on track. Unfortunately for Venezuelans suffering right now, the future does not look bright.